We’d love your help. Let us know what’s wrong with this preview of Mostly Harmless by Douglas Adams. There’s nothing worse than a frustrated teenager with a copy of the Hitchhiker’s Guide to the Arthur Dent hadn't had a day as bad as this since the Earth had been blown up. To ask other readers questions about Mostly Harmless, please sign up. Wait a minute... Doesn't a trilogy have three books, not five? Caleb Peiffer For normal people. But this is Douglas Adams, my friend. The laws of mathematics are no more relevant to him than the laws of any other science. It's terribly amusing that the majority of reviewers have tossed this fifth part to the trilogy aside, banished it from their mental schemata of the series so as to acknowledge only that which ends well. I think it says a lot about the readership that they took in the entirety of the first four books without picking up on the melancholy and nihilistic subtext to Adams' writing. I mean, the first book ends with the discovery that the meaning of life is 42.... how much clearer does it need to be in order convey the ultimately meaningless adventure that Adams saw life in this universe to be? More importantly, at what point did that fact ever stop him from telling a spectacular story? It is the journey, more than the end, that defines us and the worlds we live in. I think Arthur's encounter with the man on the pole in Hawalius can be taken as a pre-emptive response to those who would invariably decry the novel to be "too bleak": humans seek to be protected from knowing the things we don't want to know about, and it leads us to miss a great deal of understanding, experience, and acceptance, sometimes with dire psychological consequences. A reader may not want to know how the story of Arthur and his companions ultimately ends, or how any story that goes on long enough must end, but it's a blind and willful ignorance that serves no purpose but to save us seeing reality, in all its complicated and multidimensional depth of cause and effect and pure probability. 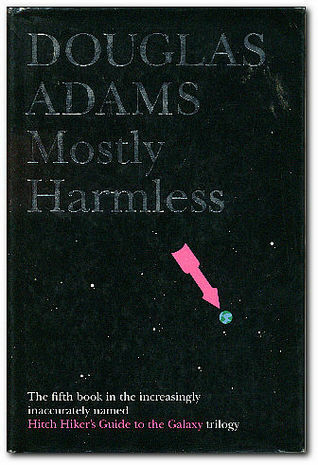 Mostly Harmless is the closing chapter of Douglas Adams' series, Hitchhiker's Guide to the Galaxy. Unless, you want to count And Another Thing by Eoin Coffer as the last installment of the series, but by all extensive purposes I leave it at Mostly Harmless. I am unsure if I will follow the guide any further, since my American Express card was rejected through my elaborate travels. Mostly Harmless follows one Homo Sapien, Arthur Dent, on an exuberant, random, and slightly sad adventure through space, time, and multiple dimensions. Arthur is one of the last humans in the entire universe, and all he wants to do is return home to Earth, or a place like Earth, or somewhere he fits in. He would like a place where he could sit with a cup of tea, or walk to the pub. Unfortunately, Earth was destroyed to make an interstellar highway, which dragged Arthur on his biggest, unwanted adventure. The whole series is a roller coaster ride of random, hilarious (hence the random Ron Swanson bacon gif) events that Arthur cannot shake off. Will he ever have a nice, quiet, simple life, where he can makes sandwiches!? I have to say I enjoyed being in the back seat of Arthur's miserable, sulking life, while he and Ford Prefect get pummeled by rocks. Or when Arthur crashes onto another planet. Everyone knows he is stranded, but no one rescues him. Insurances companies are to blame. I cannot tell you if the series has any real point, besides Arthur trying to fit in somewhere. I guess, we all want to fit in somewhere. Then again, I didn't really care if the books had a point at all. All I wanted was to have my sides ripped apart, because I was laughing so hard. On one particular occasion, my daughter asked me why I was laughing. I explained the reason to her, but she didn't seem to understand the humor. I should of known she wouldn't laugh. What did I expect from an almost three-year-old, who laughs at being chased around the house!? I do not think I could find a funnier series. There are only a few times in life where I could laugh at a rocket being launched at a main character. Will I read this series again? I bet you two sandwiches of Perfectly Normal Beast, and my towel that I will. It was the best laugh I had in a long time. The whole series was my type of humor, and I cannot beat that. Next time, I will buy the books instead of Martin Freeman narrating for me. Martin Freeman did a fabulous job, even if he said squirrel a little awkwardly. Stephen Fry narrates the the first book, Hitchhiker's Guide to Galaxy, and he did a stunning job as well. I do recommend this series to all of you, if you like science, space, and a whole bunch of ridiculous, impossible stunts. Go and grab your copy of the guide. Remember to bring your towel, and don't PANIC. Everything will be alright, I hope. Happy reading. The fifth and final installment in the Hitchhiker “trilogy” is generally regarded as the weakest in the series (it’s the lowest rated on this site, for example). The story is focused on Arthur Dent and Ford Prefect. Poor Arthur, who finally found happiness at the end of book four, has the love of his life whisked away from him senselessly and is back to wandering the galaxy alone. He finally settles down to a life that many would find mind-numbingly dull but that suits Arthur just fine. Just as The fifth and final installment in the Hitchhiker “trilogy” is generally regarded as the weakest in the series (it’s the lowest rated on this site, for example). The story is focused on Arthur Dent and Ford Prefect. Poor Arthur, who finally found happiness at the end of book four, has the love of his life whisked away from him senselessly and is back to wandering the galaxy alone. He finally settles down to a life that many would find mind-numbingly dull but that suits Arthur just fine. Just as he begins to grow accustomed to his new role in the universe, Trillian and then Ford show up to pull Arthur back into their chaotic adventures. Ford has discovered a plot that puts not just the Guide, but the universe itself at risk and, once again, a reluctant Arthur is pulled along for the ride. The book has two problems. The first is that it simply isn’t as laugh-out-loud funny as the first three Hitchhiker books. Series staples like Zaphod Beeblebrox and Marvin the Paranoid Android are nowhere to be found, and Trillian plays a relatively minor (if complicated) role. I think that part of what makes the first two books so hysterical is the interplay between all of these larger than life characters (including Ford) and the bewildered Arthur. Like a sitcom with a great cast, it’s at it’s best when all the key players are together. The comedy slips a bit in book three when the characters begin to drift apart, and by the fourth entry some of the regulars are beginning to disappear entirely. But in book four, Adams shifts the story from intergalactic mayhem to a (relatively) conventional love story. Unexpectedly sweet, the fourth book is able to alleviate the pain of losing the Zaphods of the galaxy by telling a different kind of tale. But very little is sweet about this book, which brings us to problem number two. Mostly Harmless is kind of a downer. Adams was apparently going through some personal problems when he wrote this, and described it as “a rather bleak book.” He expressed interest in writing a sixth novel to finish the series on a more upbeat note, but died before he had the opportunity. We are left with a somewhat sad ending to a great series, particularly (view spoiler)[ the grim, fatalistic conclusion (hide spoiler)]. While I begrudgingly accept that comedy is subjective and not everybody’s funnybone is tickled the same way, it’s hard for me to imagine somebody not liking the first two books in this series (even though I know these readers exist). But this one…let’s just say I can see how a reader would find Mostly Harmless to be mostly bleh. The Encyclopedia Galactica, that venerable compendium, has a lot to say about the works of Douglas Adams. In particular, the first four books of his 'Hitchhiker's' series have over 7 million words dedicated to them. This includes synopses, critical analyses, research projects, philosophical treatises and Babel-fish fan-fiction. But the fifth book in the series has not enjoyed this level of attention. Until recently, the Galactica article regarding this novel comprised a single word; 'pointless.' The Encyclopedia Galactica, that venerable compendium, has a lot to say about the works of Douglas Adams. In particular, the first four books of his 'Hitchhiker's' series have over 7 million words dedicated to them. This includes synopses, critical analyses, research projects, philosophical treatises and Babel-fish fan-fiction. A sub-set of literature fans didn't appreciate this and launched an extensive campaign to rectify the situation. They argued that Mostly Harmless wasn't a lazy cash-grab or evidence that Adams didn't give a crap by that point. Or at least that it was more than just those things. So while most agreed that Mostly Harmless paled in comparison to its predecessors, they felt that it was still funny and featured a distinctly sad perspective. They wrote impassioned essays about the book's themes regarding the search for purpose and the inevitability of fate. One particularly poignant contribution talked about how much of the novel felt like the beginning of a brand new adventure, a brand new series, and that made the sudden finality of the ending feel crushing. There are some good lines in this, but I can't help feeling it would have been better if Adams had left it unwritten, or at least unpublished. It is very disjointed, with Ford, Arthur and Trillian mostly in separate stories. It starts in what would be a parallel universe - if such things existed, which they don't, because "it makes as much sense as the sea being parallel". "If there was one thing life had taught her it was that there are times when you do not go back for y Hitchhiker's, volume 5. "If there was one thing life had taught her it was that there are times when you do not go back for your bag and other times when you do. It had yet to teach her to distinguish between the two types of occasion". "The messages that one part of her brain was busy sending to another were not necessarily arriving on time or the right way up". "For something she hadn't expected... it wasn't going the way she expected". Maximegalon Institute of Slowly and Pointlessly Working out the Surprisingly Obvious. The future is "just the same old stuff in faster cars and smellier air". "It occupied the same co-ordinates in space time [as Earth:]. What co-ordinates it occupied in probability was anyone's guess". "The sun was quite bright but the day was hazy and vague". "A common mistake... when trying to design something completely foolproof is to underestimate the ingenuity of complete fools". "Her mood swings were very unpredictable but so far they'd all been between different types of bad ones... She had been sent as a test of his faith, if not his patience". AmEx "gave cards exclusively to just about anybody". "about three other customers... it was not the kind of place that you felt like being that specific in". "The possible continually interfered with the probable". Sadly, the five-part Hitchhikers Guide to the Galaxy “trilogy” ends not with a bang, but a whimper. With four storylines — displaced earthman Arthur Dent, reckless Hitchhiker’s Guide correspondent Ford Prefect; Trillian, the earth woman once named Tricia McMillan who dumped Arthur at a party to go into space with Zaphod Beeblebrox, and Tricia McMillan in a parallel universe where she stayed on earth — Mostly Harmless reads like a frenzied ride on the bumper cars, with storylines beginning and st Sadly, the five-part Hitchhikers Guide to the Galaxy “trilogy” ends not with a bang, but a whimper. With four storylines — displaced earthman Arthur Dent, reckless Hitchhiker’s Guide correspondent Ford Prefect; Trillian, the earth woman once named Tricia McMillan who dumped Arthur at a party to go into space with Zaphod Beeblebrox, and Tricia McMillan in a parallel universe where she stayed on earth — Mostly Harmless reads like a frenzied ride on the bumper cars, with storylines beginning and starting almost at random. In addition, Arthur Dent returns to his whiny and mostly dazed persona that made him insufferable in Life, the Universe and Everything, and while all four storylines eventually converge, the denouement simply isn’t that satisfying. Take my advice: Stop after the fourth book, So Long, and Thanks for All the Fish, and end on a high note. Randal: Which did you like better? Jedi or The Empire Strikes Back? Carefully read The Hitchhiker's Guide to the Galaxy, then imagine that the most horrible, depressing conclusion possible to the whole affair could happen. That is what happens in Mostly Harmless. It wraps every loose end up most completely, but it wraps things up the way a car compactor packages your favorite vehicle. The atrocities the author commits towards his characters in this book significantly impact my enjoyment of the rest of the series. The first few pages start out depressing and it j Carefully read The Hitchhiker's Guide to the Galaxy, then imagine that the most horrible, depressing conclusion possible to the whole affair could happen. That is what happens in Mostly Harmless. It wraps every loose end up most completely, but it wraps things up the way a car compactor packages your favorite vehicle. The atrocities the author commits towards his characters in this book significantly impact my enjoyment of the rest of the series. The first few pages start out depressing and it just gets worse until by the end it left me aghast and in tears -- and not in the way good books do that to me. It is single-handedly the most depressing book I've ever read, in part because the first four books create such an engaging, likable universe filled with delightful characters. There's a theme of loss laced through this book. It goes from the sudden loss of someone you care about, to losing your child's youth through over-work, to losing even more. (I won't spoil it.) It's a depressing theme. It isn't something the character learns from, or grows through. It is just loss and pain and misery. Do yourself a favor and avoid this book. Douglas Adams has always had such a massive influence on my writing. I don’t think there’s any other author out there who does madcap, irreverent and downright silly as well as he does. This book, the fifth in the series, continues the craziness of Arthur Dent, Ford Prefect and Trillion, but with the usual unexpected twists and turns, ranging from random daughters (literally called Random) to multi-universes and holy sandwich makers. Blissfully bonkers stuff. I’m not really sure about this book. At first I was going to suggest that it didn’t have any point but then again this is a part of the Hitchhiker’s Guide series, which basically means that the books aren’t going to have a plot, or a point. Well, I guess the lack of a plot, and a point, is a point in and of itself because it simply goes to demonstrate the absurdity of existance, and that is that there really seems to be no point to this whole thing we call reality and Is That It? Its years since I read the first four volumes of the Hitchhiker's Guide to the Galaxy and really enjoyed it. Perhaps my taste has changed or I can't get into the 'mood' but I really didn't enjoy this book. It just seemed to be a 'clever' messa round with words and the sort of adolescent fantasies of the universe that kids who were stoned and listening to Pink Floyd tended to come up with. Like a lot of things, it was more fun to have lived it than to read about it. There were a couple of good sen Its years since I read the first four volumes of the Hitchhiker's Guide to the Galaxy and really enjoyed it. Perhaps my taste has changed or I can't get into the 'mood' but I really didn't enjoy this book. It just seemed to be a 'clever' messa round with words and the sort of adolescent fantasies of the universe that kids who were stoned and listening to Pink Floyd tended to come up with. Like a lot of things, it was more fun to have lived it than to read about it. Otostopçu'nun Galaksi Rehberi serisini hiçbir otostopçunun bulamayacağı galaksinin en gizli saklı köşelerine gömüyorum. Üzerini toprakla örtüyorum ve görmemek için hiçbir iz bırakmıyorum. Bir daha absürt (komedi) hiçbirşey okumamaya dair yemin ediyorum. Çok fazla 250-300 sayfalık kitaplarla oyalandım. Artık ciddi birşeyler okuma zamanı geldi de geçiyor bile. Let me just say that 'Mostly Harmless' totally shocked me out of my chair. I read the first four books and pretty much loved the humor, storytelling and not to mention the characters. Some new characters are made in 'Mostly Harmless', and if I had to choose a favorite new character, it would be Random. Random as in her name IS LITERALLY RANDOM. The irony of the whole story made me really, really excited. The whole tale goes in a roundabout of time and space and ends up where we started. The ending w Let me just say that 'Mostly Harmless' totally shocked me out of my chair. The ending was totally mind blowing. i couldn't believe it. If you read it, you'll know what I mean. Lots of irony and lots of very funny jokes, RECOMMENDED!!! And the reason why I gave it four stars? :) Even though the books over, I still go hitchhiking the universe with my trusty towel. Good luck to all you!! Now there's a neat ending, if I ever read one. It was brilliant, however bleak. I could not find in here (in the fifth and last book of the "trilogy") quite so much of the beloved cuckoo sense of humor that made his books always so irresistible to me. However, I did appreciate the proper science fiction-y feeling to it, which was of course well done, having been produced by the magnificent imagination of Douglas Adams. I miss you and I regret never having met you, Mr. Adams. I hope they have goo Now there's a neat ending, if I ever read one. I miss you and I regret never having met you, Mr. Adams. I hope they have good tea, wherever you are. I can't highlight all the passages that I like in this book because I would end up highlighting the entire book. I enjoy slipping things in that are quotes from any of the Hitchhikker's guide books into conversations with people just because it makes me smile. There is just so much wit to choose from. “Nothing travels I can't highlight all the passages that I like in this book because I would end up highlighting the entire book. I enjoy slipping things in that are quotes from any of the Hitchhikker's guide books into conversations with people just because it makes me smile. Douglas Adams finishes off the series with a flourish. Much better than the last book, there was a lot more action, space adventure and silly humour. I loved Arthur and the whole sandwich making thing he had going on, it was hilarious, his interactions with Random were quite funny too. I didn't like Ford all that much though, his parts dragged and he just wasn't very entertaining. The ending was a tad depressing with what happened to all the Earths. I guess it was better to end in that way because then the gang would forever travel in space/time, and would never stop having mad adventures. I combined my review for all of the Hitchhiker books in to one post. It just felt easier that way. Well, this series was quite a tumultous read. I really enjoyes myself reading this and, as the humour is very witty and clever. However, sometimes the setting is so random it took me some time to understand what was actually going on. Having read the last book of the series, book 4 feels a bit pointless. Nevertheless, I recommend anybody interested in the series to read it completely! Bir hikayenin daha sonuna geldik. Serinin önceki kitaplarını göme göme finale kadar geldim. Buruk ama fena olmayan bir sonla iyi kötü bağlamış Douglas Adams. Bu serinin her yeri açıklarla dolu. Biraz olayların akışına ve anlatıma kendinizi kaptırıp ne neydi diye fazla düşünmemeniz gerekiyor. Maalesef bu konuda ilk kitaptan sonra sürekli eksikti serimiz. Yani olaylar ilk kitapta çok iyi yerlere gidebilirdi. Merak uyandırdı ama beklenen olmadı. Tadı damağımızda kaldı. Sonraki kitaplar hikaye düştü Bir hikayenin daha sonuna geldik. Bu serinin her yeri açıklarla dolu. Biraz olayların akışına ve anlatıma kendinizi kaptırıp ne neydi diye fazla düşünmemeniz gerekiyor. Maalesef bu konuda ilk kitaptan sonra sürekli eksikti serimiz. Yani olaylar ilk kitapta çok iyi yerlere gidebilirdi. Merak uyandırdı ama beklenen olmadı. Tadı damağımızda kaldı. Sonraki kitaplar hikaye düştü düştü, perişan oldu. Overrated bir seriyle karşı karşıyayız. Sonuç olarak ilk kitabın ekmeğini yemiş, bir radyo programı olarak başlayan hikaye yapımcıların yazarı zorlamasıyla çalakalem bir hale gelmiş. Bu seri ülkemizde faaliyet gösteren ekşi sözlüğe de ilham olmuş. Buradaki "otostopçunun galaksi rehberi" pek çok açıdan sözlüğe benziyor farkettiyseniz. Bu kitaba özel bir soru soracağım." eee marvin? zaphod??" For some reason this fifth volume is not included in most collection of Hitchhiker's Guide to the Galaxy and I've only realised this recently. As with most of Adams' book, I finished the book with the feeling that I only sort of know what was going on and wasn't really sure what the point of it was but I had so much fun along the way that I didn't really care. This edition sees a new guide being created which works across all the dimensions. Queue chaos. Arthur Dent spends a great deal of time b For some reason this fifth volume is not included in most collection of Hitchhiker's Guide to the Galaxy and I've only realised this recently. As with most of Adams' book, I finished the book with the feeling that I only sort of know what was going on and wasn't really sure what the point of it was but I had so much fun along the way that I didn't really care. This edition sees a new guide being created which works across all the dimensions. Queue chaos. Arthur Dent spends a great deal of time being a sandwich maker and loves it but my favourite part of the book was a space ship which got confused and lost of all it's inhabitants minds. An alien race who have no idea what there purpose was so guess is very funny. The ending of this one is really odd, it just sort of ends. It almost feels like it could have continued for a little longer and Adams had planned to write a sixth book but died before he had chance. It's a shame as there just feels like there is more to tell.